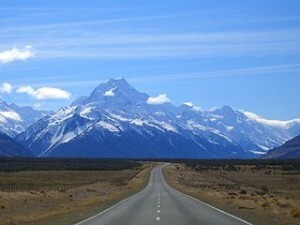 New Zealand is located at southern tip of the hemisphere makes this country is quite isolated from the world hustle. Other countries currently busy constructing tall buildings and large industries, the number of New Zealand people only a tenth of the number of sheep was lulled by the quiet life on the farm with views of endless green. Prestige of New Zealand increased rapidly thanks to Peter Jackson, a film director who managed to make people tempted to taste the beauty of nature through the setting of the Lord of the Rings trilogy and recently released The Hobbit. For fans of this film, there are several tours that offer a location for the film background. But don’t expect see exact same view from the movie, because a lot of additional visual effects used in this film. Sports fans may know that the most popular sport in New Zealand is rugby. Rugby is played by two teams consist 15 people. By using the elliptical ball, they have to throw the ball over the pylon to score. The famous new zealand rugby team called All Blacks. And if you visit to New Zealand, don’t forget to watch live Rugby match. Rugby player was tall and big. New Zealand is a country with 4 seasons and each season has its own charm. Relying interest in the activities offered by the various seasons, trip preparation is also different. If you traveling in the winter, the luggage will definitely be a lot of having to bring a sweater, scarf, thick jackets, and other garments made from thick. New Zealand as one of the famous western countries which are not cheap. However, traveled there with a very limited budget is allows. There are several budget pressed bias, such as the cost of accommodation, transportation, and food. As for the cost of travel activity, try to choose the activity you want to do because every tourist activity is not cheap.